Jonathan Edwards (1703-1758) is American’s greatest theologian and philosopher. One of the key figures in the ‘Great Awakening,’ he entered Yale at twelve and was Head Tutor at twenty-one. Edwards pastored congregations for over 30 years and earned a reputation as a consummate rhetorician and master preacher. Shortly after becoming President of Princeton University he died of complications from a smallpox inoculation. He is buried in Princeton cemetery. 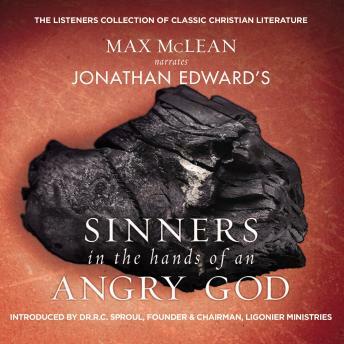 Sinners in the Hands of an Angry God was preached on July 8, 1741 in Enfield, Connecticut. It is considered the most famous sermon ever preached in American history. The vivid imagery Edwards employed made some tremble and cry out for mercy. Others fainted. Five hundred people were converted that day.